The brouhaha reignited debate about India’s rampant and unchecked illegal trade in birds and animals. This year has been particularly tough for the country’s natural heritage. Earlier in 2017, a raid by the Directorate of Revenue Intelligence at the house of a retired colonel and his national-level shooter son in northern India unearthed a staggeringly large cache of animal skins, parts, and meat. The seized booty included 117 kg of nilgai (blue bull) meat, leopard skins, ivory, horns from swamp deer and sambar deer, antlers from antelopes and blackbucks, and deer skulls. In August, a huge consignment of animal parts was seized from the northeastern state of Assam. The haul included 43 deer heads with antlers, two clouded leopard skins and as many heads, one bear head and skin, 800 grams of bones of different types, one hornbill beak, one wild goat head with antlers, and four otter skins. Studies suggest that over 200 species of birds found in India are traded to be used for different purposes, including petting, consumption, medicine, and zoo exhibits. Rhinos too, are now on the list of endangered species due to the trade of rhino horn. A WWF-India document lists a large number of wildlife species across India — everything from birds to marmosets, moths to tigers — are sold by poachers and illegal traffickers. “Each rhino horn fetches about Rs 300,000 rupees ($4,600) in India and at least 30 percent more in the international market. There’s also great demand for rhino meat and bones for medicinal purposes in China, Korea, Taiwan and Japan,” says Vivek Johri, senior manager at the Department of Forest & Wildlife in New Delhi. The expert adds that the main incentive for the illegal wildlife trade is the premium such goods fetch in the market. “The cost of a kilogram of ivory has shot up from $750 in 2010 to $2100 in four years. Rhino horn is today sold at a whopping $ 29,000 a kilogram,” he adds. A recent book titled State of India’s Environment 2017: In Figures highlights an unsettling 52 percent spike in poaching and wildlife crimes between 2014 and 2016. Over 30,382 wildlife crimes and mortality were recorded through December 31, 2016, says the book, which was published by the nonprofit Center for Science and Environment. The number of species that are poached or illegally traded in the country likewise trended upwards from 400 in 2014 to 465 in 2016, the book notes. Recent seizures have highlighted threats even to India’s national animal and bird, the Royal Bengal tiger and the peacock. In 2016, 50 tigers were poached, the highest number in the past decade, spite long-standing conservation efforts being in place. WWF for Nature launched its flagship Project Tiger in 1973, one of the world’s largest and most important initiatives for the conservation of Royal Bengal tigers. 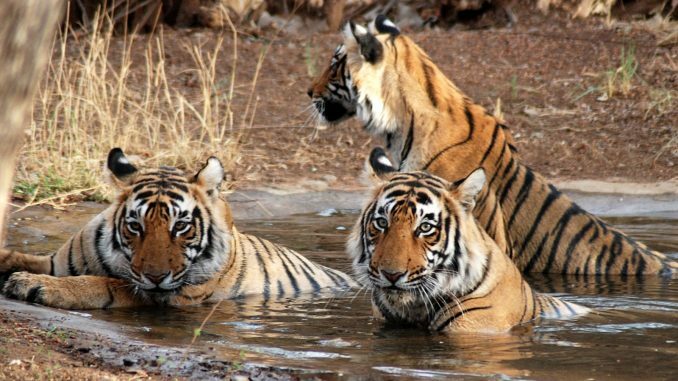 In 1997 a Tiger Conservation Program was added to bolster the protection of tiger activities in India and other Asian countries. Meanwhile, thanks to poaching between 2015 and 2016, 340 peacocks were killed, a 193 percent rise over 2014. Blackbucks, blue bulls, chinkaras, elephants, leopards, rhinoceroses, spotted deer, and wild boars are all similarly threatened, say conservationists. “Seizure reports point to the large and international nature of illegal wildlife trade in India. They also illustrate the increasingly organized and sophisticated operations of criminal syndicates involved in the trade,” says Raja Lakshman, a wildlife conservationist who is currently documenting the decline of precious flora and fauna in the Himalayan belt. The conservationist points out that most of seized wildlife products were destined for neighboring countries via land routes. Other seizures were made along air and maritime routes to Southeast Asia, West Asia, and Europe. Studies estimate the illicit wildlife trade to be worth about $5 billion, the fourth largest smuggling market on the transnational crimes scene (after drugs, weapons, and human trafficking). The wildlife trade includes primates, ivory from elephants, orchids, live birds, reptile skins, butterflies, animal furs, and tropical fish. Tigers are executed for their bones and skin. This is not to suggest that India lacks a robust legal and policy framework to regulate and restrict the wildlife trade. On the contrary, current laws prohibit trade in over 1,800 species of wild animals, plants, and their derivatives under the Wildlife (Protection) Act, 1972. The Indian Penal Code and The Prevention of Cruelty to Animals Act 1960 empower authorities to penalize and jail those who harm wildlife. India has also been a member of the Convention on International Trade in Endangered Species of Fauna and Flora (CITES) since 1976. The international agreement between governments aims to ensure that the international trade in specimens of wild animals and plants does not threaten their survival. However, experts say that the main reason for the unabated wildlife trafficking across India is its porous international land borders. Native and non-native species are being brought in for illegal trafficking, threatening biodiversity and conservation in the wild. There are many bottlenecks in ensuring efficient checks on wildlife trafficking, say experts. Among the biggest is the exponentially growing demand for animal trophies in India. The Ministry of Environment, Forest, and Climate Change reports a spike in applications from the public for permits to import trophies from African countries such as South Africa, Cameroon, Namibia, and Zimbabwe. While before 2010, there were only a few applications, the number shot up to 250 in 2015. The species that yield trophies are hunted in Africa by Indian hunters and then various parts are imported into India in the form of full animal mounts, shoulder mounts, skulls, skins, horns, scrotum, feet, and hooves. To discourage the practice, the Ministry took a policy decision in 2014 to prohibit the import of trophy articles made of species listed in CITES or lookalikes of any species protected under the Wild Life (Protection) Act, 1972. However, the measure has not been too effective. Where does the solution lie? Experts say India’s biggest challenge is the implementation of laws, due to the paucity of staff among monitoring authorities. The lack of political will and governance failures worsen the situation. Disincentives for over-exploitation and illegal trade, such as penalties for legal infringements are also not strong enough. According to WWF-India, there is an urgent need for knowledge and action to bring the legal wildlife trade within sustainable levels and stop all illegal trade, which has threatened and even pushed many species towards extinction. A report titled “The Environmental Crime Crisis,” which focuses on the consequences of environmental crime, argues that the situation has worsened to the extent that the impacts of illegal wildlife trade are now acknowledged to undermine not only the environmental but also economies and livelihoods, governance, and the rule of law. Inaugurating a program during “Wildlife Week,” India’s Union Minister of Environment, Forest, and Climate Change Dr. Harsh Vardhan iterated that India is playing a leadership role in the management of wildlife through involvement of local communities. Pointing out that no program can succeed solely because of government policies, Vardhan emphasized that peoples’ participation is critical for success. “Five crore [50 million] people living around national parks and sanctuaries are working as partners in environment conservation,” he said. He also launched a 15-year National Wildlife Action Plan (2017-31) with a special focus on peoples’ participation. While such initiatives augur well, much more needs to be done to protect and preserve India’s wildlife given the enormity and pervasiveness of threat. Climate change, pollution, and loss of forested areas are already wreaking havoc on the ecosystem. Poaching wildlife as well will not only end up killing animals, but also ruin biodiversity, leading to an unbalanced food chain and ultimately threatening all forms of life.